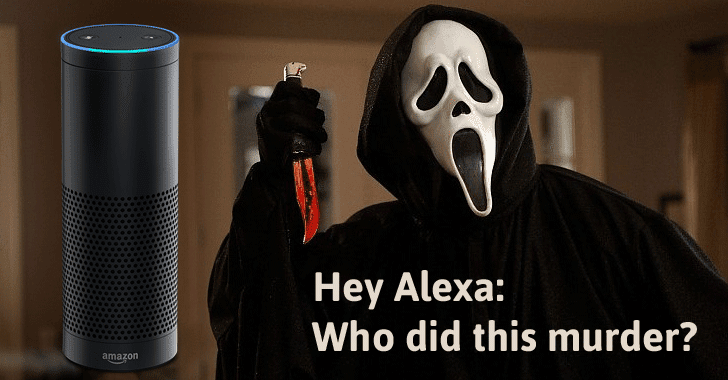 Hey, Alexa! Who did this murder? Arkansas police are seeking help from e-commerce giant Amazon for data that may have been recorded on its Echo device belonging to a suspect in a murder case, bringing the conflict into the realm of the Internet of Things. Amazon Echo is a voice-activated smart home speaker capable of controlling several smart devices by integrating it with a variety of home automation hubs. It can do tasks like play music, make to-do lists, set alarms, and also provide real-time information such as weather and traffic. As first reported by The Information, authorities in Bentonville have issued a warrant for Amazon to hand over audio or records from an Echo device belonging to James Andrew Bates in the hope that they'll aid in uncovering additional details about the murder of Victor Collins. Just like Apple refused the FBI to help them unlock iPhone belonging to one of the San Bernardino terrorists, Amazon also declined to give police any of the information that the Echo logged on its servers. Collins died on November 21 last year while visiting the house of Bates, his friend from work, in Bentonville, Arkansas. The next morning, Collins' dead body was discovered in a hot tub, and Bates was charged with first-degree murder. As part of the investigation, authorities seized an Amazon Echo device belonging to Bates, among other internet-connected devices in his home, including a water meter, a Nest thermostat, and a Honeywell alarm system. Echo typically sits in an idle state with its microphones constantly listening for the "wake" command like "Alexa" or "Amazon" before it begins recording and sending data to Amazon's servers. However, due to its always-on feature, it's usual for the Echo to activate by mistake and grab snippets of audio that users may not have known was being recorded. Some of those voice commands are not stored locally on Echo but are instead logged onto Amazon's servers. Presumably, the authorities believe that those audio records that the Echo device might have picked up the night of the incident and uploaded to Amazon servers could contain evidence related to the case under investigation. While the online retail giant has twice refused to serve police the Echo data logged on its servers, Amazon did provide Bates' account information and purchase history. The police said they were able to extract data from Echo, though it's uncertain what they were able to uncover and how useful that data would be in their investigation. According to court records, Bates' smart water meter shows that his home ran 140 gallons of water between 1 AM and 3 AM the night Collins was found dead in Bates' hot tub. The prosecution claims that the water was used to wash away evidence after he killed Collins. Should Amazon Share the Data or Not? The authorities in the Collins murder case are asking for data on Amazon's servers that could help bring a criminal to justice. If so, authorities should get access to it. In the case of Apple vs. FBI, Apple was forced to write a backdoor software that could bypass the security mechanism built into its iPhone, while the company already handed over the data stored on its server. The broader takeaway: IoT devices automating your habits at home could be used for or against you, legally. The Collins murder case appears to be a first-of-its-kind, and we are very much sure to see more such cases in the future. It will be interesting to see how the companies that make smart home devices would serve its customers while maintaining a balance between keeping their customers' privacy safe and aiding the process of justice.